The stars may finally align against buyout-baron taxes. A group of self-proclaimed “patriotic millionaires” wants to end a provision that allows private-equity partners to pay lower taxes on their investment profit. The two U.S. presidential candidates back the idea, too. Proposals to eliminate the so-called carried-interest rule have failed to gain enough traction for nearly a decade, ever since they came to the forefront around the time Stephen Schwarzman and Pete Peterson were taking Blackstone public. Most recently, a 2015 Senate amendment failed on a 55-43 party-line vote of Republican opposition and Democratic support. A previous push in 2014 under a broad tax-reform plan also faltered. The industry has fought the good fight. The Private Equity Growth Capital Council, which just rebranded itself as the American Investment Council, spent more than $2.5 million in 2014 in Washington while the group representing hedge funds spent $3.7 million, according to the Center for Responsible Politics. The buyout lobbying group argues the current tax system encourages the kind of risk-taking needed to grow companies. While the stakes may seem low, at just $17 billion of additional revenue over a decade, according to the Congressional Budget Office, the concept of fairness is growing in importance. The Patriotic Millionaires, a collection of about 200 wealthy individuals, unveiled a lobbying effort Thursday to force private-equity bigwigs to pay more like 40 percent in taxes on their carry instead of closer to 20 percent. The group is targeting influential lawmakers, including Republican Senate Finance Chairman Orrin Hatch. Other politicians are on board. In a tiny plot of common ground, both Donald Trump and Hillary Clinton have railed against the loophole. So, too, did wildly diverse candidates Bernie Sanders and Jeb Bush, perhaps reflecting broad populist sentiment against special privileges for the rich. A Republican-dominated Congress coupled with influential fund managers might stall any change again. They can be bypassed, however. The capital-gains treatment of carried interest was adopted by the Internal Revenue Service in 1993 and reaffirmed in 2005. The Treasury Department, just as it has managed to stop U.S. companies from overseas acquisitions to reduce their taxes, could instruct the IRS to change its interpretation. With any luck, the momentum at last will reach sufficient speed to roll over this senseless tax policy. 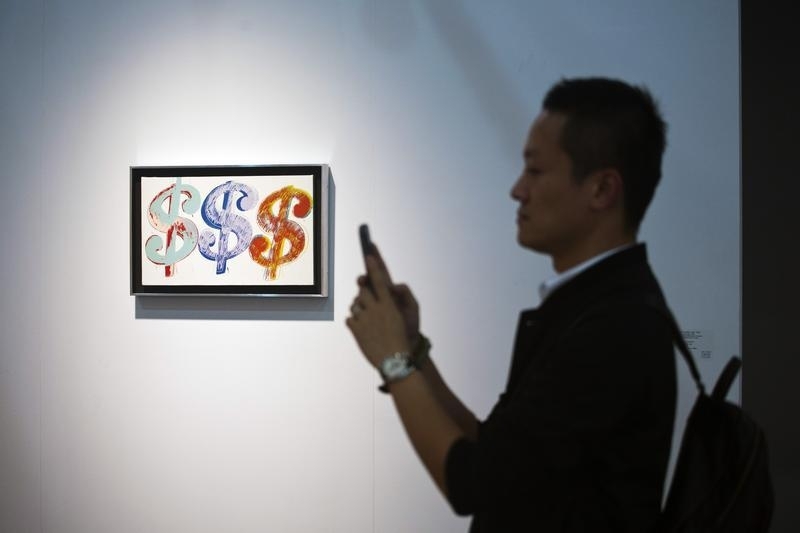 A man takes pictures with his phone next to an artwork titled "Triple Dollar Sign" by U.S. artist Andy Warhol during a preview of the first Art Basel in Hong Kong May 22, 2013. The Patriotic Millionaires, a group of more than 200 wealthy Americans, on June 23 called on Congress to eliminate the current tax treatment of so-called carried-interest income for partners of private investment funds. The treatment of this profit on investments is considered a loophole because it is taxed at a lower capital-gains rate of about 23 percent, instead of at an income-tax rate of about 40 percent. The group, which is chaired by former BlackRock Managing Director Morris Pearl, recently registered as lobbyists to push lawmakers on the issue. They support the Carried Interest Fairness Act, which was introduced by Democratic Senator Tammy Baldwin from Wisconsin and Representative Sandy Levin of Michigan. Similar bills have been introduced regularly in Congress for years, but have failed to gain traction in part because of lobbying by the private-equity industry. Separately, Republican presidential nominee Donald Trump and Democratic rival Hillary Clinton have expressed support for such a proposal.